Portable Guard Shacks and Their Advantages | BIG Enterprises Inc.
A portable guard shack is a building that is physically manned as part of safety protocols for your business. Although a permanent shack is a consideration, one that is portable offers the advantage of mobility. For that reason, the popularity of portable guard shacks has grown substantially. Especially when the shack is manufactured by a reputable company, you know that you will get more “bang for your buck”. While this type of structure is called a “shack”, it is actually a modern building that can be enhanced with multiple features and amenities and even customized based on your specific needs. Start with the fact that the shack is portable. For this, manufacturing is done off-site. When finished, the structure is delivered to your location, and then placed anywhere you wish. That means that if your company needs to move an access point or information kiosk elsewhere on your campus, it is simple to tow it to its new location. This is both convenient and a huge cost savings. As stated, construction of a portable shack takes place off-site. During construction of a permanent shack, everyone at your company would have to work around the mess but also the loud noise of equipment and machinery. The possibility of temporarily losing parking spaces is another concern. With a portable shack, business goes on without disruption. A guard shack can serve multiple purposes. Although its primary use is to give the operator control of the outside of your business, thereby adding a layer of protection that is critical in today’s society, it can be used for other things. For example, the portable shack can be used as a material storage unit, observation point, attendance booth for special events, and much more. Beyond security, a portable guard shack creates a comfortable work environment for the guard. The shack can be enhanced and even customized with numerous features and amenities. These include air conditioning and heat, comfortable floor mats, adjustable shelving, and cabinetry, among other things. Not only are your employees more comfortable, they are more alert and productive. If your situation warrants it, the guard shack can also be designed with tempered glass and a bulletproof exterior. At B.I.G. 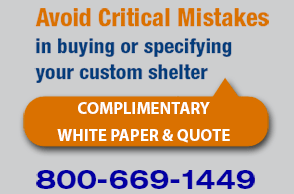 Enterprises, we ensure that you get everything you want and need in a portable guard shack. You can learn more about this and other products by visiting our website or to meet with a team expert, please give us a call.